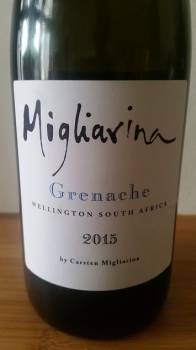 “Keep it simple,” is sommelier-turned-winemaker Carsten Migliarina’s philosophy and his Grenache 2015 is agreeably fruity and fresh. From a Wellington vineyard approximately 15 years old, the wine was tank fermented and then matured in untoasted barrels. Strawberry , flowers, earth, spice and an intriguing back note of mint on the nose. It has an abv of 14% so not short of stuffing. Serve chilled with a chop off the braai. Approximate retail price: R150 a bottle.